Our Microfiber cleaning cloths are gentle on your surfaces while achieving the best results. But like anything else—there’s microfiber, and then there’s microfiber! We’ve tested over 100 cloths to find the very best microfiber cleaning cloths. We’re proud to say our gold-standard cloths are ultra-thick and absorbent, which gives them the "squeaky-clean" reputation that we’re proud to put our name on.What's different about a microfiber cloth? The microfibers in this cloth are too small to see. It looks just like a normal towel, but it works in a totally different way. Suppose you want to clean a large, dirty wall as quickly and thoroughly as you can. You could use a toothbrush, but it would take you forever. So probably you'd opt to use the biggest brush with the most bristles you can find. Now scale the problem down. If you want to clean a worktop really well, what's the best thing to use? You can't use a gigantic brush or even a huge cloth, but you can achieve the same effect by using a cloth that packs more punch into the same cleaning area. An ordinary cleaning cloth has fibers made of cotton or a synthetic material such as nylon. You've seen pieces of cotton so you know exactly how big the fibers are. 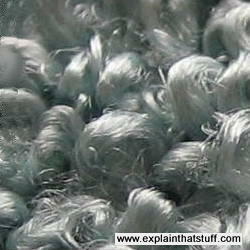 But a microfiber cloth has far more fibers and they're much smaller. If "many hands make light work", so do many fingers—or many micro-fibers. Why do smaller fibers clean better? 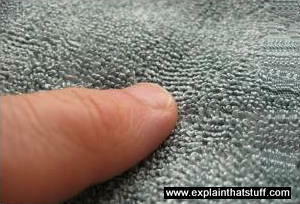 Microfibers are able to attach themselves to even the smallest, most microscopic dirt particles—ones that normal cloth fibers (positively giant in comparison) crudely brush past. Do microfiber cloths "wear out"? Providing you keep them clean, good quality microfiber cloths will keep on cleaning hygienically. One recent study of using cloths like this to reduce rates of hospital infection found that "re-usable cloth performance improved at 75 washes, and reduced after 150 washes, although, in most instances, performance after 150 washes was better than at first wash."